As documented by The Humane Society, euthanasia by gas inhalation can be unreliable and cause prolonged suffering and great distress. Death is not always quick, as it can take up to 25-30 minutes to end an animal’s life, and loss of consciousness and brain function occurs only after vital organs are shut down. Further, where multiple animals are gassed at the same time, feelings of panic and excitability can cause fights to break out. A far more effective, and painless, method of causing death is euthanasia by injection (EBI), using sodium pentobarbital, which results in clinical death within 2 to 5 minutes, and loss of consciousness within 3 to 5 seconds. Clearly, then, EBI is more humane, and yet it still isn’t legally mandated in most states. The fact that stray companion animals, like Daniel, are routinely subjected to die by gas inhalation seems surprising, given that for pet owners, the procedure is rarely used. How can this disparity in treatment be explained? Perhaps the disparity is indicative of society’s inconsistent attitude towards stray and adopted animals, viewing the latter as possessing greater inherent value or being more deserving of protection. Hopefully, with Daniel’s story garnering national attention, this attitude will change. If animals are to be euthanized, at the very least, the killing process should be as painless and humane as possible; it should not make a difference whether an animal is stray or not, only that it is capable of suffering. The only solution is spay and neuter which unfortunately many pet owners refuse to do for many reasons, one being they do not like to pay for it even though it is not expensive if done early on and another stupid reason is that their pet will not cause overpopulation. Lack of education, greed, stupidity and many other human-only reasons cause unmeasurable suffering to dogs and cats. Unfortunately there are even worse forms of euthanasia recommended by The U.S, Dept of Fish and Wildlife. For birds that are deemed unreleasable back into the wild they recommended wildlife rehabbers place the bird in the freezer. This has been upgraded this year to placing the bird in a plastic bag and rubber banding the bag to the exhaust pipe of a running vehicle. Mandatory euthanasia of all wildlife deemed unreleasable back into the wild is a Federal Wildlife Rehabilitation Law. May what we do to others, which includes animals, wild and tame, be done to us, our children,our loved ones to the 7th generation! Accept the central premise of our view of nonhumans–that their value is something we humans project, not an inherent quality they possess–and the most appallingly arbitrary distinctions start to make sense. One may call this the Odious Fallacy. Concede the O.F. and it becomes clear at once that ‘unowned’ animals should in fact be treated with far less consideration than ‘owned’ ones, or really, with no consideration at all; the worth of nonhumans, in this distorted perspective, is purely the function of how much a human happens to care about them. A nonhuman to whom no human is sentimentally attached thus becomes raw matter, a morally insubstantial mass of tissues who can and must be disposed of in the cheapest way possible. Excellent comments! Bravo Tony P. for cutting through the linguistic solecism by which we try to obscure our shocking inhumanity. 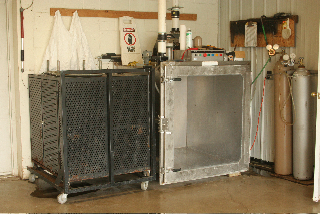 A gas chamber does seem like a horrendous way to kill animals. But I also understand that some facilities resort to it, because the euthanasia drugs are so expensive, and animal shelters tend to be chronically over-worked and under-funded. Of course, the real problem still rests with irresponsible pet owners. Spay and neuter your pets. When an abused or abandoned or lost animal finds respite in a shelter, I would hate to think that the shelter is prepared to do away with her — by gas, chemical, bullet, or any other means — if she comes down with a curable disease or cowers in a corner or has been locked up past her allotted time. Anyone in a foreign place, much less a cage, is bound to be terrified and lonely — and not act look or act like a model candidate for adoption. It’s not attacking the root of the problem to convert a shelter that uses a gas chamber into a shelter that uses fatal injection for equally specious reasons. The immorality and injustice of shelters using killing as an easy out is the real problem. Shelters are supposed to act the way their name implies: protect all animals from avoidable harm. That involves doing whatever it takes to find their temporary residents good homes as fast as possible. The modern No Kill movement has proven that the vast majority (even 98%) of dogs and cats (and rabbits and guinea pigs and ferrets and rats and mice, etc.) in open admission shelters CAN be rehomed and become wonderful companions. If shelter directors are committed to saving lives, they permit no excuse for wanton killing — not space reasons, not treatable-illness reasons, not food-aggression reasons. In No Kill shelters, true euthanasia is confined only to those creatures who are suffering from an irremediable terminal illness or whose aggressiveness is deemed beyond hope of altering. Yes, eliminate gas chamber killing — and every other kind of killing. The burden of proof that killing can’t be stopped is on the shelter killers, not on the public. There are many more responsible and loving would-be guardians than there are irresponsible ones. And there are many more households looking to bring home a new dog or cat than there are dogs and cats in shelters. So … it’s up to the shelters to find these folks, market to them, attract them to events, and sell them on the merits of the wonderful animals who are waiting for a good home. In other words, reach the public before the public opts for pet shops (puppy mill dogs), breeders (reputable and otherwise), and Internet sellers (again, often puppy mill dogs). If a shelter cannot make a commitment to respect the dignity and intrinsic worth and right-to-life of each resident, citizens must demand a replacement who CAN and WILL honor each animal in the way they deserve to be honored. That’s my two cents — and it’s dittoed by my two rescued dogs and two rescued cats (and even by the two dogs I bought as puppies before I knew better). My computer messed up and I didn’t get a “subscribe” notice, so I’m trying again …. Meanwhile, I’ll add here that I don’t believe some dogs are superior to others, based on whether they are “owned” or stray, whether they are full-blooded or mixed, whether they are blind or deaf or three-legged or hairless. Similarly, I don’t believe that any method of killing is more acceptable than another. The whole killing machine — and the speciesist, classist mentality behind it — is rotten, like the state of Denmark. What an insult to the victims of gassing, suffocating, lethal injections, electrocution, poisoning or whatever method of “disposal”, to call these places a “shelter”. What a pathetic lie! Thank you and thank you again BlessUsAll! The truth about killing (murder) needed to be said and repeated at every opportunity! When animal shelters are full far beyond capacity, something’s got to give. Going into a faux moral tantrum and yelling “murder” won’t solve a darned thing. I don’t know of a single shelter manager who ever relished killing animals. But the harsh reality is, they are often left with no choice. Adopt a shelter animal. Take in a stray. Keep pounding the “spay and neuter” drum. One can’t change the world, but one can still make a change. Let’s hope that one day euthanasia will be eliminated in all shelters. With increased education, more people will adopt shelter pets and save them from euthanasia. Hopefully it is only a matter of time.